Welcome to the Resurrection Greek Orthodox Church! We thank you for visiting our website and taking the opportunity to learn about the beauty captured in the Orthodox Faith. Our Resurrection Parish family consists of over 200 faithful families (stewards) who make up the body of Christ in worship. Our community is unique to the East Bay area because of its multi-ethnic background, as well as its small size, (compared to other Greek Orthodox Churches in the surrounding area). We are a parish of the Greek Orthodox Archdiocese of America, Metropolis of San Francisco. The Greek Orthodox Archdiocese is directly under the Ecumenical Patriarchate in Constantinople (Istanbul, Turkey). 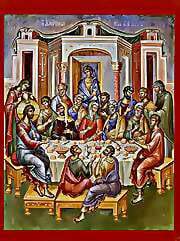 We are part of the One, Holy Catholic and Apostolic Church, established by Our Great God and Savior Jesus Christ. The Orthodox Church is not Roman Catholic, nor is it Protestant. It was united with the Church of Rome until the 11th century, at which time the “Great Schism” took place. We are deeply saddened by this split and we pray continually for the unity of the faith. We are located in Castro Valley, California, which is situated in the East San Francisco Bay area.